The Hunger Games movie saga, which stars Jennifer Lawrence as revolutionary poster girl Katniss Everdeen, reaches its conclusion with The Hunger Games: Mockingjay – Part 2. I saw it last week, and the review embargo has just been lifted. The series – based on Suzanne Collin’s popular book trilogy – took me by surprise. I was lukewarm about the initial instalment, both before and after seeing it. In hindsight, this is probably not because of the quality of the film itself (directed by Gary Ross), but rather my own prejudice. The Hunger Games: A Running Man and Battle Royale rip off? As a teen I had seen Arnie in The Running Man (1987) – based on a book and set in a dystopian future where the state sanctions a TV death match as a means of pacifying the populace. Later, I had marvelled at the magnificent Japanese movie Battle Royale (2000) – also based on a book and set in a dystopian future where the state sanctions a TV death match as a means of pacifying the populace. So with what seemed to be the same set up – teenage ‘tributes’ battling to the death for the masses on mass media – it was through this lens that I watched The Hunger Games (2012). As far as I was concerned it was as expected – largely derivative of Battle Royale and The Running Man (the latter of which isn’t even particularly good) with added YA (young adult fiction) dust. But looking back, the beginnings were there for what has become an intelligent an engaging saga. With Francis Lawrence installed as the new director for the rest of the series, the first sequel The Hunger Games: Catching Fire (2013) added layers of political and media commentary & satire, while remaining true to being a YA action adventure. The first part of the follow up story The Hunger Games: Mockingjay – Part 1 (2014) took us into the territory of the war film, which is where this concluding chapter remains. Central to the success of this saga remains the confident and engaging performance from Jennifer Lawrence, who as Katniss Everdeen has come to embody how powerful a well realised female action hero can be. The film picks up immediately after the events of Part 1 – Katniss is suffering both mentally and physically from the effects of being almost strangled to death by her former District 12 fellow tribute Peeta Mellark (Josh Hutcherson), who has been brainwashed by President Snow (Donald Sutherland) into believing that Katniss is evil. The new Katniss/Peeta dynamic is central to their relationship in this film. Katniss spends much of the story afraid of him, and lamenting that the Peeta she knew is gone. He in turn is full of hate for Katniss, and simply wants to kill her. Despite their mutual distrust/loathing, they are thrown together for the sake of the continuing media battle of Penem, and the pair’s importance as propaganda puppets. Katniss is beginning to tire of being used as a political tool, this time by President Coin (Julianne Moore). In this film, Katniss finally decides it’s time to write her own story. Like Peeta’s hate for Katniss, she has a singular vengeful purpose now – to kill President Snow. As far as she’s concerned he is solely responsible for the misery of the world about her. She wants to see him dead, and preferably by her hand. Also remaining in the mix is Gale (Liam Hemsworth). As well as his ongoing role in the love triangle with Katniss and Peeta, he continues his transformation into a callous revolutionary fighter – displaying a crueller streak than before. He is another character hardened by the ongoing war. Of the other key players, President Snow continues his unsettling relationship with Katniss, and Sutherland is as sinister as ever. In not dissimilar fashion, Julianne Moore’s President Coin is on the surface a heroic leader, but what lies beneath is also troubling. Her determination to control Katniss plays out in the wider context of the war and its aftermath. There are no ‘Hunger Games’ per se in this movie. Instead, Snow deploys the gamemakers to devise ever more imaginative (and TV friendly) ways to defend the city from the invading rebel army. This leads to some visually stunning scenes, but the stand-out sequence is a subterranean set-piece that is as tense and exciting as anything you are likely to see this year. Jennifer Lawrence displays Katniss’s archery skills to full effect, in a thrilling ensemble action scene. The previous film suffered from an obvious fault – it was only part of the story, where not very much happened, and there was very little payoff. The whole thing felt like a preamble towards the next instalment. But this film is given the chance to explore themes and characters fully. It brings the story to a satisfying conclusion, in a way that is surprising, dramatic, and powerful. Friendships are shattered, and loved ones are lost. For everyone left standing at the end, the world will never be the same. All is not perfect with this concluding chapter. The story has a clear conclusion, and what follows is a lengthy epilogue that is crying out for a pair of scissors to wrap up the story with the brevity it deserves. It’s not quite Return of the King level, but disappointing all the same. Also, while I’m not familiar with the books, a few of the characters seem to get short shrift in the movie, despite the 2hr+ running time. Someone who certainly doesn’t feel absent – but with less do do than previously – is Philip Seymour Hoffman. He died during filming and before his scenes had been completed. I think I spotted a couple of occasions where he may have been digitally inserted into scenes, and there appears to have been one obviously important passage that was rewritten for another actor. But I was on the lookout for these instances and I don’t feel they will distract from the story. Overall, this is an engaging conclusion to a saga that began with what seemed to be less ambitious aims. The series has cleverly dealt with themes of political manipulation, propaganda, and the damaging effects of war on society. These are all messages that are of great relevance today, and will continue to be so. The fact that these ideas are dealt with so thoughtfully within an exciting action adventure, that appeals especially to teens, is a great credit to all involved with this – from author Suzanne Collins to the actors and filmmakers. Teens obviously have a natural defiance against authority and the status quo. These stories highlight the positives of that attitude, and how we would all do well to remember that feeling as we move beyond those years. The character of Katniss, and Jennifer Lawrence’s terrific performance, will continue to be a benchmark for female led action adventures. She has inspired a generation of girls to aspire to become confident and proud women, and hopefully educated their male peers to accept this as a reality. The Hunger Games series has demonstrated once and for all that the time of the female led action adventure is now. That they can be engaging across a series of movies and be hugely popular with audiences, especially if created with integrity, respect, and intelligence like this series. I’ve written previously about how I have no problem being called Mr. Mom, the name of the 1983 movie starring Michael Keaton. In short, I find it quite endearing. In the movie, Keaton plays Jack, an engineer who gets laid off. Struggling to find another job, his previously stay-at-home wife Caroline (Terri Garr) successfully restarts her career. The working dad becomes Mr. Mom. I have fond memories of the movie, but probably hadn’t seen it since the eighties. Browsing Netflix for something, my wife suggested we watch it. I warned her it was pretty silly, and she probably wouldn’t like it. Well, as it turned out, she didn’t like it and gave up less than halfway through. I stuck with it though. It was interesting to revisit what was probably my first exposure to a dad staying home with their kids, something I am now doing myself. I was struck that the movie did in fact cover a lot of interesting and relevant themes around the swapping of traditional gender roles in the household. This is essentially a situation comedy, and for comedic effect Jack doesn’t choose his new role, it is thrust upon him by becoming unemployed. It’s interesting that one of the reasons for the rise of the number of stay-at-home dads is the recession. Many fathers have lost their jobs, while their wives either haven’t or have found work instead (just like Jack and Caroline). These dads may have found themselves taking on a role in the home they never intended to. Initially our decision for my wife and I to swap at-home and working roles was made because each of us wanted it. When we relocated from NZ back to the UK, my wife landed a great job quickly, while I picked up freelance work here and there. So there is a mirroring of the situation, inasmuch that my wife is more employable than me, and that is one of the reasons I am home with the kid. I was struck by a scene where Jack goes to see a temp agency, and gets involved in a conversation two other male jobseekers are having. Turns out they are enthusiastically sharing recipes, the implication being that they too are in the same situation as Jack. I’ve had a similar situation – where another dad and I were moaning about laundry. On this occasion, a mum overheard us and sarcastically commented “Well, what a manly conversation you two are having”. One of the myths of Mr. Mom (as far as I’m concerned) is this – the storyline of a mother trying to seduce Jack. I can reliably report that there hasn’t been a hint of sexual tension in any of the various baby groups, classes, playgroups, etc. that I have attended in my years as a stay-at-home dad. 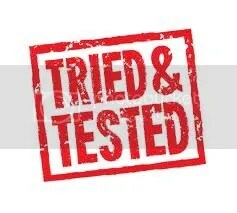 Even if my mother friends and I weren’t all happy in our respective relationships, it strikes me that the life of the lead parent of a baby/toddler is too tiring to go to the effort of having an affair. But like Jack, I’ve also let my appearance slide while being home. I was never a smart dresser anyway, but now my day-to-day outfits tend to consist of jeans with holes, and old t-shirts and tops. As I have a short window to use the shower before the munchkin gets up, shaving tends to be left to the weekends too. As a happily married man who interacts with mothers with partners most of the week, I’m not trying to impress any of them with how I look. In the film, Jack ends up forming a fairly close social circle with local mums. Since my first time with the antenatal group, and then befriending local mothers in our new area, I have formed good friendships with mothers. I have never felt awkward in these all female environments, which I must admit surprised me. My wife often reflects on the fact that I know far more mothers in our local area than she does – though they’ll often say hello to her at weekends, because they recognise our daughter. The way the role change affects the mother also has a lot of truth to it. Working mother guilt is an established societal issue, which my wife is no stranger to. I wouldn’t, however, berate my wife the way Jack does, for all the things she has missed while at work. I know we are very lucky that my she supports us, and I know she feels like she is missing much more than she actually is. A theme of the film is the style of Jack’s parenting compared to a mother’s. Do dads parent differently than mothers? I don’t know. My fairly relaxed parenting style is shared by a lot of mothers I know too. Like Jack, I have fed my baby (well, toddler) chilli, and while I’ve never dried her bum on a hand-dryer, I have held her over men’s urinals many times. But mothers have told me of instances when their kids have accidentally swigged beer, or they’ve fed them nothing but white toast all day – the kind of things ‘Mr. Mom’ would do too. Ultimately, there is something important about Keaton’s portrayal and the way Jack is written. Confidence. Jack acts like he has every right to be there in all these situations, and that’s exactly how stay-at-home dads should be. The movie is only partly about a hapless hopeless stay-at-home dad. He quickly finds his feet, and then owns the role of at-home dad. Many men who have also spent their time working, and less around their kids, may understandably also experience this transition too. Jack may do things a little differently, but not necessarily because he’s a man. I’m not going to lie to you – the eighties slapstick humour, of which this is full of, falls fairly flat now. Comedies of this era were full of similar gags, and they haven’t aged well. But I’m glad I revisited it. The film makes a compelling case for the positives of being a stay-at-home dad, or even an engaged dad, and that there’s no rule that dads MUST be the breadwinner of the family. I’m sure that influenced my subsequent thinking. I have no idea why I wanted to become a stay-at-home dad so much. I had no role models in my friends or extended family that have done it. What I do have is the fond memories of watching this film as a child. Perhaps Mr. Mom planted the seed of an idea to become a stay-at-home dad, that became a reality many years later. Curious to watch the movie? Check it out on Netflix. 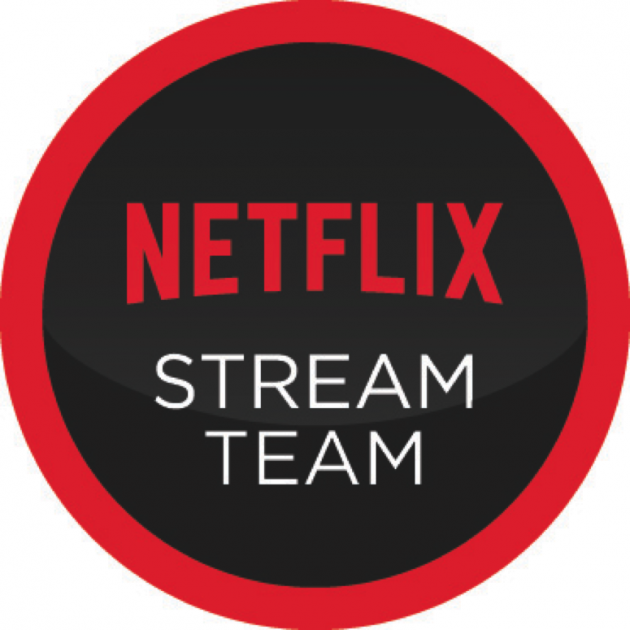 FeaturedPosted on October 31, 2015 November 2, 2015 Categories BlogTags Netflix, Sponsored, StreamTeam2 Comments on Is Mr. Mom My Mentor? I don’t know much about the character of Supergirl. She is Superman’s cousin, is blonde, and wears a skirt. We’ve seen a few appearances from her in some animated shows. I toyed with showing my daughter the 1984 Helen Slater movie, but I remember it being terrible. But Supergirl – as a concept – has been an easy shorthand to help my daughter to engage with superheroes. She is familiar with Superman, mostly from the Donner movies and the 90’s animated series, and the concept of a female version inspires her. If she puts on a cape, her default hero to be is ‘Supergirl’. If she wears a top with the ‘S’ insignia, again she is ‘Supergirl’. Given this, I was excited by the prospect of a Supergirl TV show, so she could engage with the character directly. When I saw the first photos of Melissa Benoist in character, she certainly looked the part. She also had a warmth to her expression, that went against the prevailing darkness of most superhero adaptations these days. This would hopefully be an uplifting show. An early trailer left me feeling a little wary, as it was rather close to this viral Black Widow rom-com parody. This week we finally got to check out the TV show, on Sky 1 in the UK (minor spoilers ahead). The set up is that the teenage Kara flees the doomed planet of Krypton right behind her baby cousin Kal-El (aka Superman), but as is the way with these things, she arrives long after him – so long that while she hasn’t aged, he is now Superman. She was supposed to protect the baby, but now she is the child who needs his help. She grows up choosing not to follow him into the heroic business. We find her stuck in a dead end job working for Ally McBeal (Calista Flockhart plays her ‘Devil Wears Prada’ like boss Cat Grant). Her life is going nowhere. She seem unfulfilled, until circumstances lead her to use her powers to prevent a plane crashing, and a hero is born. Much set-up follows, including her costume (trying to justify the short skirt and cape), name (trying to justify the use of ‘girl’ over ‘woman’), and who the villains are (no spoilers). Being a) the female version of a male hero, and b) being called ‘girl’ means this probably isn’t going to be the definitive strong female superhero many are clamouring for. But despite this I am happy for my daughter to engage with Supergirl (like Batgirl before her) because they can still be excellent, empowering characters when handled right. Plus, my daughter is proud of being a girl, so the name is one she likes. As this is a primetime US network show, I had no reason to think it wouldn’t be suitable for my 3-year-old daughter to watch with me, and I was right. While there was a little cuddling up to me while Kara faced down the bad guy du jour, this is nothing compared to how upset she gets with other more overtly kiddie fare – such as the scrapyard denouement of Toy Story 3. Will we be watching more? Absolutely. While the Devil Wears Prada aspect was there, it didn’t dominate. It’s being set-up with potential love interests for Kara, bit that didn’t drive the plot. It passes the Bechedel Test. And the superhero action was for the most part well staged. My daughter likes the character interplay as much as the superheroics, and spent the whole episode engaged and full of questions about the unfolding story. FeaturedPosted on October 30, 2015 October 30, 2015 Categories BlogTags Female Superheroes, Supergirl2 Comments on TV REVIEW: Does Supergirl Fly? FeaturedPosted on October 22, 2015 October 27, 2015 Categories ReviewTags Star Wars, Star Wars Rebels5 Comments on Star Wars Rebels – A Girl Friendly Galaxy Far, Far Away…. FeaturedPosted on October 14, 2015 October 17, 2015 Categories BlogTags Star Wars12 Comments on How on earth is Star Wars rated U (“suitable for all”)? This giveaway has now ended – but Tara Binns – Eagle-Eyed Pilot, and Tara Binns – Crash Test Genius, can be purchased from Amazon. Like many, my daughter is into superheroes and really loves creating her own. DC knows a thing or two about superheroes as well, and they have a cool new interactive Super Hero Creator for you to try. My daughter came up Green Dragon (pictured above), and Water Shark (below). Also check out some of the new videos from Warner Bros, including favourites such as Scooby Doo & Batman Unlimited. They seem pretty active with their video content at the moment. Subscribe to their channels – DC Kids Channel and WB Kids Channel – to see what else is coming up. Win An Amazing Gift Set From Warner Bros.
To celebrate the launch of the DC Kids Super Hero Creator, they have this great prize on offer. It includes Teen Titans Go Action Figures & T-Tower Set, A Batman Unlimited Action Figure, DC Super Friends Gift Set, and Batmobile. Good luck! Let me know what heroes you or your kids come up with. This past month we’ve shown our daughter a classic superhero in action, brought some long dead creatures to life, learned about the highs and lows of an iconic performer, and discovered a great new drug (show) to get hooked on. My 3-year-old daughter has declared that two of her favourite superheroes are Batman and Robin. The 1966 Batman movie is probably why. It’s ironic that the majority of modern superhero movies aren’t actually suitable for young children. That’s certainly not the case here, with this movie version of the famed campy Batman TV show. The film features largely the same cast as the show, and the same style and sense of humour. The ‘plot’ sees Batman & Robin (Adam West and Burt Ward) take on a super villain team of the Joker, Penguin, Riddler and Catwoman. Made after the first season of the Batman TV show, legend has it that it was made so the production could have access to more Bat-vehicles for the ongoing TV show – so here, as well as the iconic Batmobile, you also get the Batboat, Batcopter, and Batcycle. In an age where superhero movies have become ubiquitous and ever darker (thanks in part to the dark detective’s recent trilogy), seeing this movie is a great reminder of how much fun comic books and superheroes can be. My daughter has also taken a liking to Dinosaurs of late, after reading a book to her about them. She also has a few toys, but I really wanted to show her some film and /or TV showing them for her to engage with them even more. This was the perfect choice. Directed by Disney exile Don Bluth (An American Tail, The Secret of NIMH), and produced by Steven Spielberg and George Lucas no less, this is a great introduction to dinosaurs for little ones. It’s the story of a group of cute young dinosaurs who get separated from their family, and their journey to be reunited with them – with a T-Rex in hot pursuit. While it’s rated U, it does have a family death near the start which might upset some children. Netflix has a great documentary selection, and this (a Netflix Original) was one I’m really glad we watched. Previously, I knew very little about Nina Simone other than she was an African American performer who’s most famous song was ‘My Baby Just Cares For Me’. So I didn’t know about her role in the civil rights movement, her protest songs, the troubled family life, and the highs and lows of her career and life. A fascinating story, well constructed with a mixture of new and archive footage & interviews, with some great music too – this is well worth a watch. This is a terrific new Netflix Original series. I’m a sucker for a good organised crime drama, and this is a fine example. It’s a dramatised account of the 1980s American drug wars and the rise of the infamous kingpin Pablo Escobar. The story is told through the eyes and narration of US DEA Agent Steve Murphy (Boyd Holbrook), who guides us through the ins and outs of the emerging Central & South American drug cartels – especially the Medellín Cartel headed by Pablo Escobar (played here by Brazilian actor Wagner Moura). We’re only two episodes in, but rest assured that if we didn’t have a 3-year-old in the house we’d have binge watched it all weekend. For our latest LEGO playtest, we chose the Star Wars Imperial Assault Carrier. It’s based on one of the Empire’s spaceships from the Star Wars Rebels TV show, which featured prominently in the finale of season 1. Initially the main attraction for us was the choice of minifigures – specifically, this set includes the female Rebel fighter Sabine Wren. She’s been in a previously released LEGO Star Wars set, but this time she comes with the addition of her distinctive Mandalorian armour helmet. Sabine’s outnumbered by the Empire, as this comes with five other mini figures – all of them imperial: Agent Kallus, an Imperial Officer, 2 x Tie Fighter pilots, and an Imperial Astromech Droid (aka R2 unit). This is a large set with over 1,200 pieces, and it took us a few construction sessions to finally assemble it, following the 170 page instruction booklet. It was really fun to construct, with a mixture of standard and technic elements, and a great activity for me to share with my 3-year-old daughter. While putting together a LEGO build of this nature on her own is clearly not feasible yet (the set advises age 9-14), the experience of assisting me helps her with many aspects of her development of such as motor skills, patience, and following instructions. She was constantly asking me, over the days it took us to make this, to ‘do another packet’ (the numbered bags that large sets are divided into – this one has nine). Plus it has a hook as part of the structure, for flying it around going “Vroom, pew pew!”. At least, that’s what we used it for. The set has a kind of dual scale element, as the Tie Fighters are much smaller relative to the Tie Fighter pilots. I kind of liked this approach. The little Tie Fighters are also the perfect size for my daughter to fly around. She is delighting in the play opportunities this set affords, and is already engaging Sabine in joint adventures with a fellow female star wars minifig Princess Leia from the Imperial Shuttle set. As the father of a mixed-race fangirl, I admit to being a little disappointed that Sabine’s skin colour seems to have changed from the light brown of the show to light pink here. But she still looks badass. And while we’re talking about changes, did you know that the Imperial Officer minifig is in fact an Imperial Postman (according to a certain 3-year-old). My daughter has decided that this sad, dejected, desperate looking LEGO Star Wars figure – is a postman. The Imperial Assault Carrier is a great addition to our LEGO Star Wars collection. While the ship seemed a little uninspiring from imagery prior to getting it, in reality it is a really cool vehicle when constructed. As with her other Star Wars LEGO sets, my daughter has made no attempt to pull this apart as she’s enjoying using is as a playset and prop far too much. The LEGO Star Wars – Imperial Assault Carrier set (75106) has a RRP of £99.99, and can be purchased from Amazon. While obviously dictated (her writing isn’t that good), one of the reasons I love it is I know that it’s genuine. Our shared love of Star Wars has become a defining aspect of our relationship. I don’t know how long her love of Star Wars will last, but for now this is our thing as a father & daughter. So I’ll take my daughter thinking I’m super because I watch Star Wars with her. I also think she’s pretty awesome for watching it with me too. We Didn’t Have Any Princess Leia LEGO. So My Daughter Came Up With This Instead. Do you remember that awesome scene in The Empire Strikes Back when Princess Leia was disguised as a Stormtrooper and had a lightsaber? Of course not because it doesn’t exist – except in the imagination of my three-year-old daughter. It’s just one of the scenarios and characters she has created for the Star Wars universe with her assorted LEGO. We have a bunch of Star Wars LEGO, but sadly none that involved a Princess Leia minifig. I’ll gladly trade one of my three Luke Skywalkers or Qui-Gon’s if anyone’s interested in a swap? (Not slave Leia). But this hasn’t deterred my daughter from creating her own. She has decided a generic black ‘girl’ hair is in fact Princess Leia’s, and she first created an approximation of her Hoth look in The Empire Strikes Back. The latest incarnation of her LEGO Leia took things in a different direction. She often talks about the section of Star Wars when Han and Luke are dressed up as Stormtroopers. She’s also very into the fact that Luke and Leia are siblings, and that Darth Vader is their father. The men have lightsabers, why not her too? So one day when we were playing LEGO and I wasn’t playing attention to what she was doing (I don’t just play LEGO to humour her – I play too, building my own stuff), she suddenly exclaimed “Look! It’s Princess Leia from The Empire Strikes Back, when she was dressed as a Stormtrooper and had a green lightsaber!” And indeed it was. This is Princess Leia, disguised as a Stormtrooper, wielding a lightsaber, as seen in the Empire Strikes Back. According to my 3yo daughter. So, as we know, that scene didn’t happen, but it’s an intriguing scenario. Why has she disguised herself as a Stormtrooper? Is it an improvised solution as in Star Wars, or something more planned? How come she has a lightsaber? The force is strong in her family after all. The idea of Leia dressed as a trooper then brandishing and (hopefully) kicking off with a lightsaber is irresistibly cool. The next minifig she came up with was a bit of a mashup – the little known Sith warrior, Lady Venom. My 3yo daughter also invented this character, a Sith called 'Lady Venom', who Leia is trying to make normal again. She has a Kylo Ren style lightsaber. My daughter has no idea who Venom is, other than it was the ‘villain’ minifig with a Spider-Man LEGO set she had for her third birthday. Perhaps aware of the poor level of female representation in much merchandise, she instantly appropriated Venom as a female character. Having seen 5 Star Wars films, Rebels, and some of The Clone Wars, she also has a handle on the Sith, especially their penchant for wearing black. So, the black Venom, with added black hood & cloak (from a Darth Maul minifig) and voila – you have Sith warrior Lady Venom, possibly inspired by Asajj Ventress. According to my daughter, Lady Venom knows Leia and Darth Vader, but Leia is working to make her normal again. I have imagined that Lady Venom was once a great Jedi, who was possessed by the alien Venom symbiote and her mental turmoil was exploited by the Sith to turn her to the dark side of the force. Her red lightsaber is meant to be like Kylo Ren’s from The Force Awakens. We’ve also been trying to figure out when in The Empire Strikes Back Leia could be disguised as a trooper and end up with a green lightsaber. Our best idea would be somewhere on Cloud City – probably after Boba Fett has flown off with Han and they’re battling to get back to the Millennium Falcon. The green lightsaber? 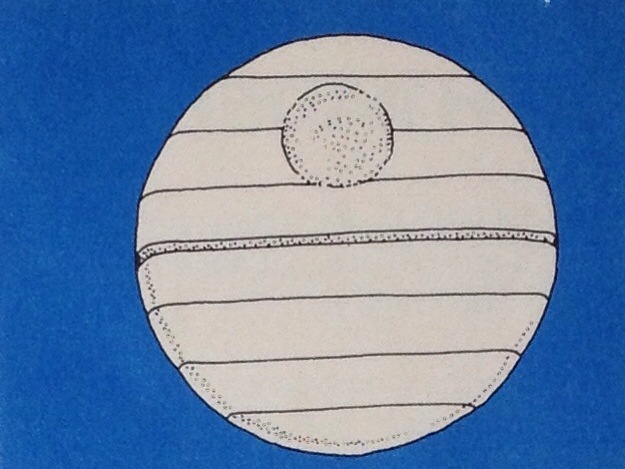 Perhaps R2 had been carrying the one he fired at Luke in Return of the Jedi for a lot longer than we all thought? Some of the most fertile ground for Star Wars creativity at the moment is between the films. The Clone Wars cartoon(s) were full of wonderful characters and scenarios, as is Star Wars Rebels. Marvel’s new Star Wars comics are doing a great job in filling in the gap between Star Wars and Empire with some really interesting ideas and developments – all of it canon. My daughter is engaging in the same kind of creative storytelling that the writers and artists of the new series of Star Wars comics and cartoons are. Only they’re overseen by the Lucasfilm Story Group. My daughter’s only limits are her ever expanding imagination. I appreciate Lady Venom is the kind of cross property mash up that Star Wars hasn’t indulged in as of yet – but if we can get Mickey Mouse Jedi knights, why not a Venom Sith? And c’mon – how awesome would a storyline involving Leia going undercover as a Stormtrooper that ends up with her brandishing a lightsaber be? Especially if she takes on Lady Venom of the Sith at the end. I propose that my three-year-old daughter join the Lucasfilm Story Group. I guarantee there will be lots of cool and kickass female characters as a result. Or perhaps she’ll make her own comic. She’s already on her way to becoming a Star Wars artist. 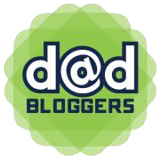 FeaturedPosted on June 9, 2015 July 19, 2015 Categories BlogTags Dad blog, Lego, Princess Leia, Star Wars4 Comments on We Didn’t Have Any Princess Leia LEGO. So My Daughter Came Up With This Instead. My daughter has various dolls – Barbie, Cindy, some Phantom Menace Padme Amidalas, a Princess Leia, and a 90’s Storm (that I randomly found boxed at a local charity shop for £2). 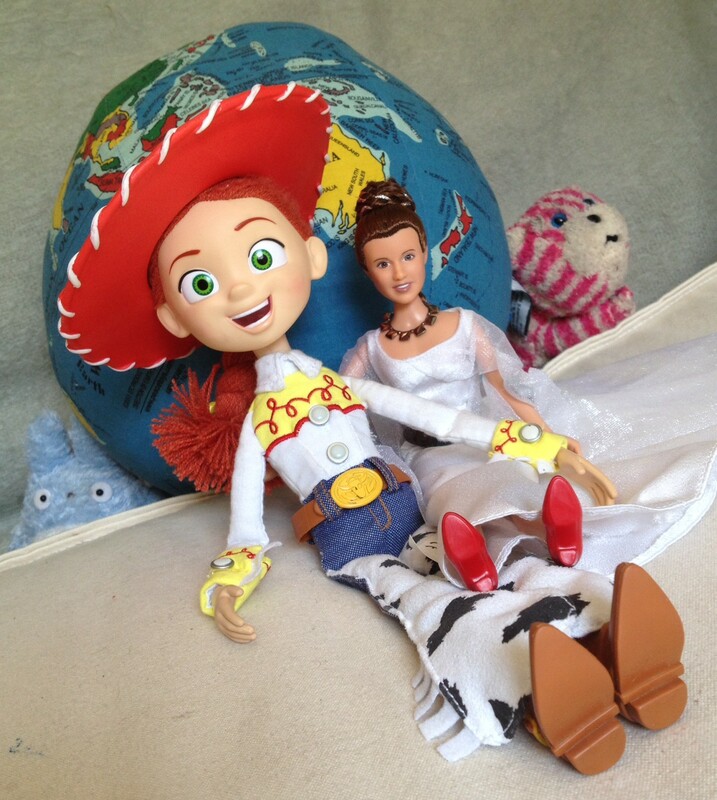 But I think she has found her favourite set of dolls yet – Lottie. I’ve been aware of Lottie ever since they launched their Superhero Outfit Set in 2014. It was notable to me because a) it was a female superhero doll, and b) was designed by a six-year-old girl, who created ‘Super Lottie’ as part of a global competition. Any misgivings I may have had about the pink, pastel, and sparkles are pretty much wiped out by the fact this outfit was created by a little girl herself. This is exactly the kind of creativity we’re trying to encourage in our own daughter, and the Super Lottie design looks pretty cool anyway. Lottie differs from other dolls in a number of ways. Her body shape is roughly that of a nine-year-old girl, as opposed to the Giraffe like proportions of Barbie. She doesn’t wear jewellery or makeup. She has a wide range of clothes and interests that kids can still relate to. If you want to buy your child princesses and fashion models, you’re already well served by the market. 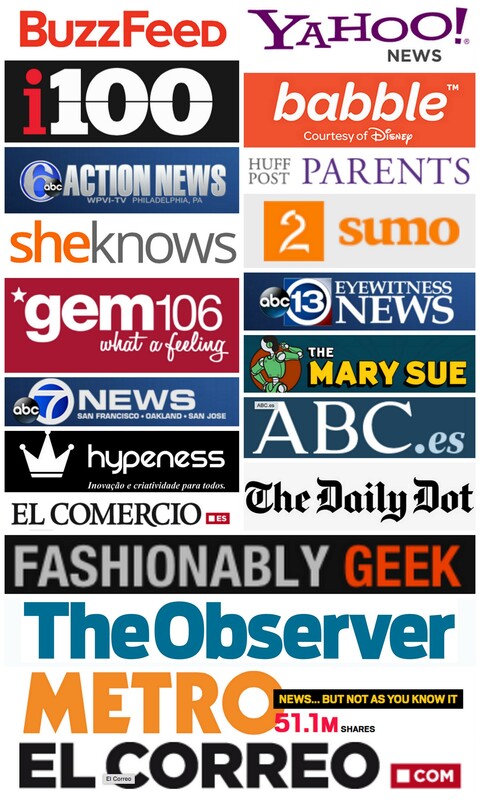 Lottie Dolls offer parents and children wanting something else a delightful alternative. For this review, we selected a range of dolls and accessories that reflect my daughter’s interests, tastes, or curiosity. Our choices were Pirate Queen (plus accessories), Robot Girl (plus Busy Lizzie Robot), Stargazer (with telescope), as well as the aforementioned Superhero Outfit. Each ‘Lottie’ comes with their own backstory or scenario, and while these are interesting – such as reading about female pirate Grace O’ Malley – the characteristics of each outfit/persona are really for us to define through play. So, ‘Robot Girl’ likes robots, and this helped us talk about science and engineering; ’Stargazer’ (inspired by a real life star loving little girl) is obviously into astronomy, and again that helps us talk about that. My daughter loves looking at the moon, and enjoys stories set in space, so this reinforces it. ‘Pirate Queen’ inspires adventure, and also supports the idea that all things pirate are for girls as well as boys. And ‘Super Lottie’? Well, my daughter knows superheroes are for girls (and boys too I guess), so again this reinforces our parenting approach in this genre. I get accused, mostly by people who don’t know me very well, of denying my daughter ‘girly’ things, or trying to make her into a boy. That’s not true. I just object to the narrow vision of girlhood that commerce presents us with. While I’m of the mind that any toy is girly if a girl plays with it, these Lottie dolls help with framing different interests as ‘girly’, presenting us with a group of cute little girls who enjoy science, karate, ponies, and pirates! If you ever need to prove to someone that robots, superheroes, and pirates, can be ‘girly’ too – then just show them Lottie. The thing I really love about this collection of Lottie dolls is that they support and reinforce so well our approach to raising our daughter. 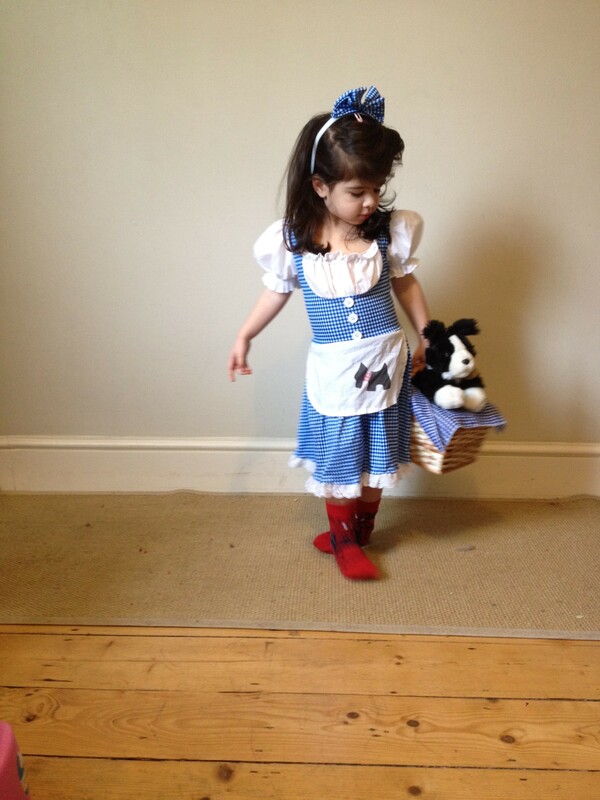 Lottie’s cool and quirky collection of clothing reflects my daughter’s own diverse wardrobe. 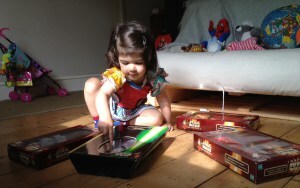 We hope Lottie’s range of interests will also be mirrored in our daughter as she gets older. What’s our favourite Lottie? While I love anything that involves girls and superheroes, my joint top pick is Pirate Lottie. Society still tends to categorise Buccaneer iconography as a boy’s look, and this demonstrates that girls make awesome looking pirates too. My daughter likes dressing as one but doesn’t see many other girls doing that too. By simply playing with her Pirate Queen Lottie, she is reinforcing her confidence in her decision to dress up as a pirate too. Being interested in science and technology. Dressing as a pirate and a superhero. These Lottie Dolls can help inspire a new generation of girls to claim these traditionally boy interests as theirs too, and aspire to reach for the stars or sail the seven seas. Or simply to be happy with whatever you choose to be. In fact, her motto is ‘Be bold, be brave, be you’. Disclaimer: While I was not paid to write this piece, we did receive all the featured dolls and accessories free of charge. 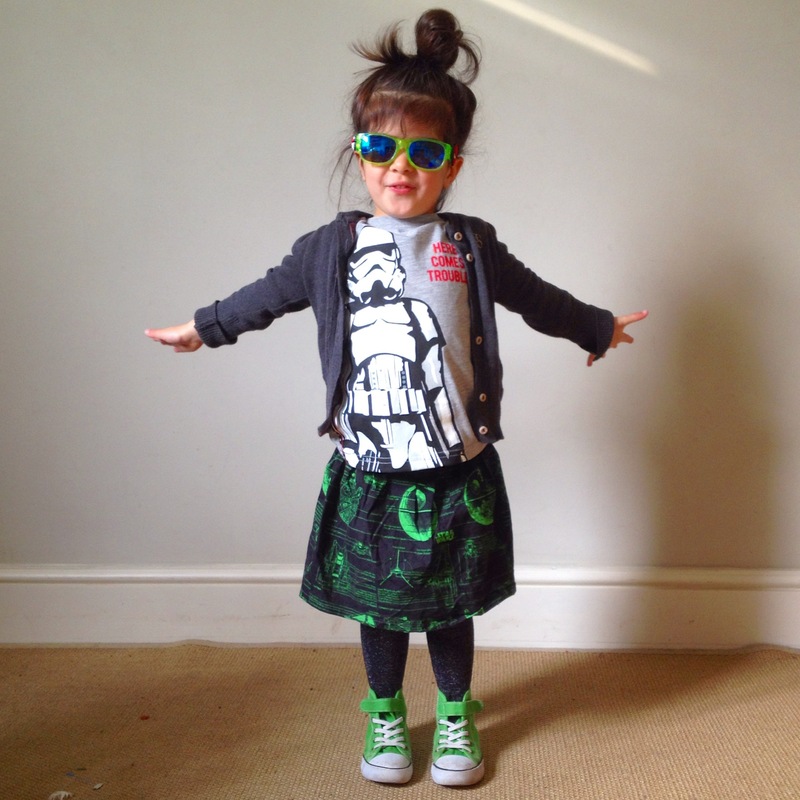 Getting Star Wars tops for girls is easy – as long as you don’t mind shopping in the ‘boys’ aisle. However, you have more chance of bullseyeing a Womp Rat in your T-16 than finding a child’s Star Wars dress or skirt for sale at a major retailer. While Ashley Eckstein’s innovative fangirl brand Her Universe has a couple of Star Wars dress options, is she your only hope? No, there is another. It’s you – by embracing Craftivism. If you can’t find the merchandise you want, simply make it yourself. My daughter recently received an awesome Star Wars skirt from our friend Francesca Cambridge, that she made using officially licensed Star Wars fabric. 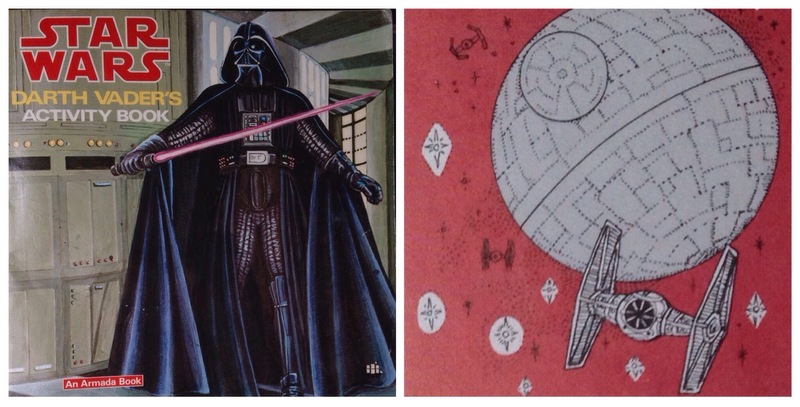 There’s lots of Star Wars and other official licensed fabric available, which is intended for home sewing use such as this. 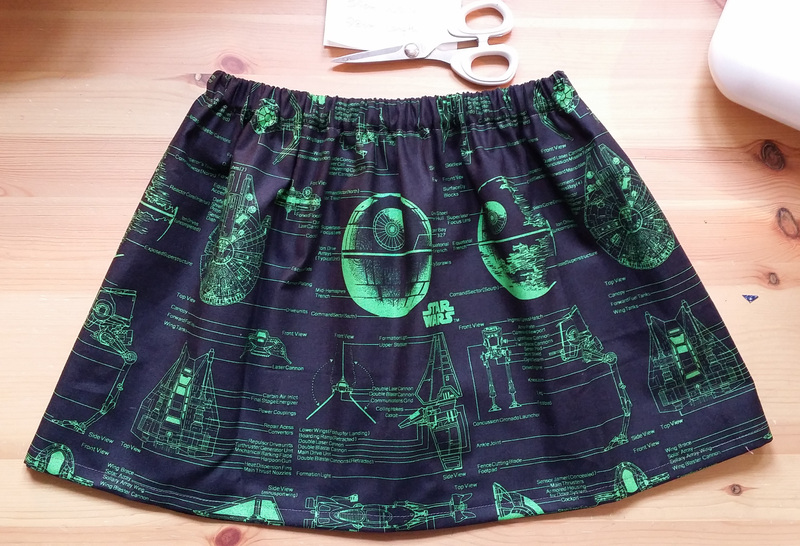 In an act of wanton selflessness (her business Sewing Circus proudly creates and sells children’s clothes that don’t conform to gender stereotypes), Francesca has put together this step-by-step guide so non-dressmakers like me can make a children’s Star Wars skirt ourselves. This elasticated skirt is one of the easiest items of clothing you can make for your child. It is so simple you don’t need a pattern or special equipment – you could even get away without a sewing machine! For this skirt I used licensed Star Wars fabric manufactured by Camelot Fabrics, bought from Frumble (who also sell everything from Alice in Wonderland to Batgirl, Supergirl and Wonder Woman fabric). But you can choose any fabric you want, in any theme, colour or style. That is how I started out, making Dinosaur skirts and Space dresses for my daughters when we couldn’t find anything remotely similar on the high street. Once you’ve built a bit of confidence you can add pockets, a drawstring, applique – anything! The sky’s the limit for your creativity and inspiring your child to do the same. About 30 mins of spare time! Cut your elastic and ensure there is ample flex room on the width of your fabric. For ages 12 plus you may need to add an additional panel to create a wider piece of fabric. The skirt length is 28cm, but we need to add on a little more to accommodate our waistband and hem, so I’ve added an extra 8cm to the length. If in doubt add more, not less – you can always trim more later. Use a ruler to guide you in cutting, never trust the pattern! This white part (that reminds me of bacon rind) is the selvage and needs to come off too. Check for an perforated dots from manufacture as you don’t want them in your final skirt. Create a channel for the elastic at the top of the skirt by folding over a thin raw edge, and then larger fold to fit the width of your elastic. You can use your elastic to guide the size, but leave at least 5mm for a sewing edge. Once this is done you can measure the length again and fold up the hem using the same method at the other end. Again, use the ruler to measure as you will now create the final length of your skirt. Sew down your pressed hem, back stitching or tieing up the ends of your thread to prevent your work coming undone. Use your elastic to guide you as its essential there is enough room for it to fit through comfortably. If you find the channel is too narrow take it back to the iron board and press larger. Sew the channel closed, but leave a 1.5″ gap at the end. This will be the opening to thread through the elastic. Thread the elastic by pushing the saftey pin through the channel. Secure the other end of the elastic as its really easy to end up loosing it as your pull through! Once you have pulled the elastic through, use a zig zag stitch to connect the two ends together with a good 1″ overlap. Don’t worry about the waist measurement just yet – you can always adjust in the next step. Ping the elastic into the skirt band, and check you’re happy with the waist measurement. If not, pull the elastic back out a little way to cut a section out and restitch together. Once you’re happy, close the waistband “channel” and tie up the threads to finish. My daughter wearing her beloved Star Wars skirt. She would wear it every day if she could. This is a little bit of Craftivism shared from what I have learnt since starting Sewing Circus, but for more inspiration please check out the many wonderful sewing boards on Pinterest for free patterns and advice! Got stuck on a sewing element? Check out the free tutorials on YouTube – even after years of sewing I find it a fantastic resource with clear instructions on almost everything. Thanks so much to Francesca for sharing with us her Craftivist solution to the lack of Star Wars clothes aimed at girls. To keep up with all the latest from Sewing Circus, please follow them on Facebook, Twitter, Instagram, Pinterest, and Etsy. A version of this tutorial was originally published on Let Clothes Be Clothes. 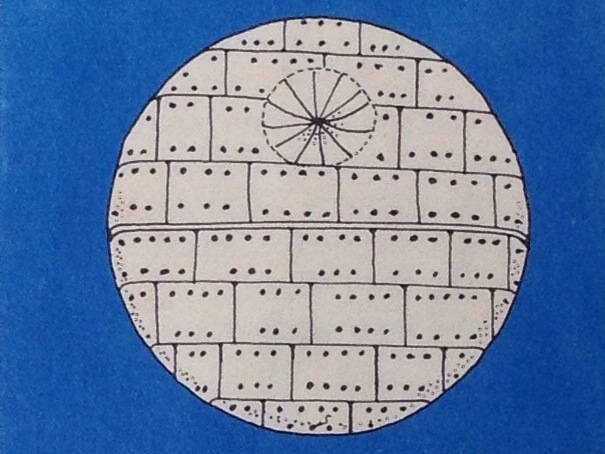 This recipe is taken from the Star Wars: Darth Vader’s Activity Book, originally published in 1979 by Random House (I have the UK Armada reprint). There’s nothing evil about these delicious shortbread cookies. They’re quick and easy to make, especially if you have an adult to help. Preheat oven to 350F. Lightly grease 2 cookie sheets. In a large bowl cream the butter and sugar. Beat in Egg well. Gradually stir in flour. Gather into a ball. Divide into two equal halves. Roll each half into a ball. 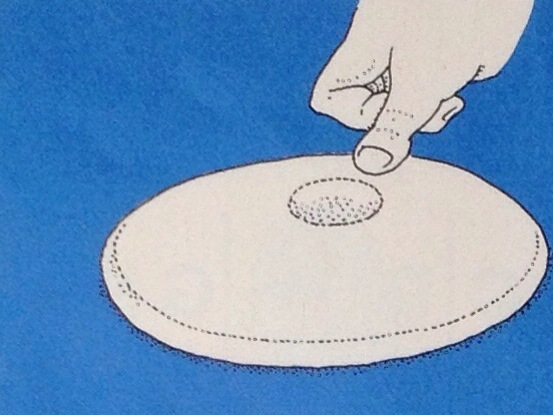 Place one ball in the centre of one cookie sheet and flatten out to a circle about 6″ in diameter and about 1/2″ thick as shown in the accompanying figure. Repeat with remaining dough on second cookie sheet. For decorating, follow the steps below. 1. With your thumb, press in a smooth round, shallow hole 1 1/2″ in diameter a little away from the edge as shown. 2. Lightly grease a butter knife and make a wide, shallow cut across the centre of the cookie. Then make shallow horizontal cuts along the rest of the cookie. Do not cut through the hole. 3. The make shallow horizontal vertical cuts between the horizontal lines as shown. Next cut a shallow outline around the 1 1/2 ” hole and make “piecuts” in it as shown. Take a fork and make rows of holes along the horizontal lines. Then bake 25 minutes, or until golden brown around the edges. Cool slightly. Remove and cool completely. 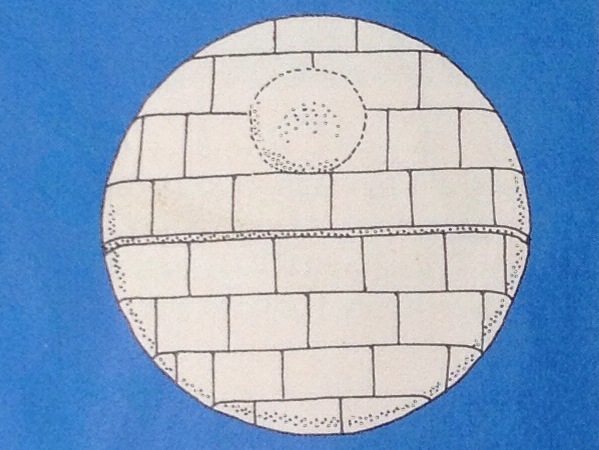 Now be a hero and destroy the Death Star – by eating it! 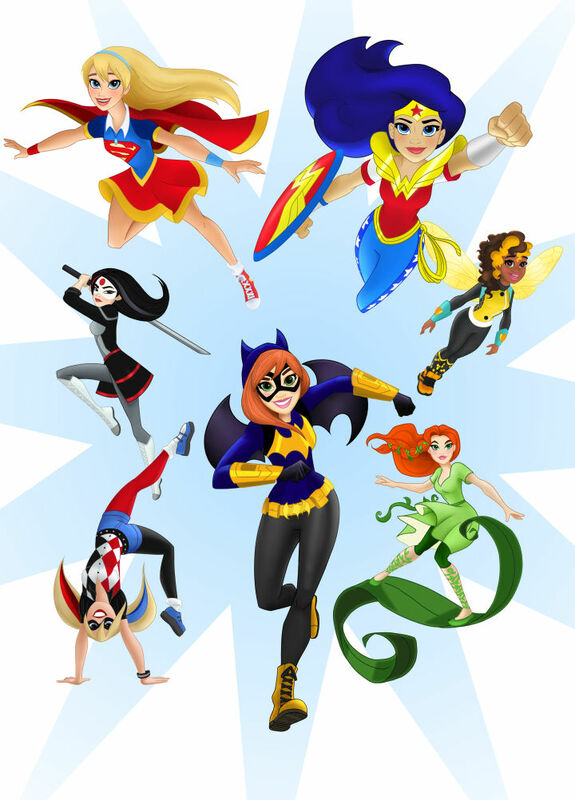 FeaturedPosted on April 24, 2015 April 26, 2015 Categories BlogTags Batgirl, DC Super Hero Girls, Disney Princess, Female Superheroes, Supergirl, Superhero, Wonder Woman4 Comments on Will the ‘DC Super Hero Girls’ Line be the Princess Alternative I’m Looking For? If you’re raising a girl, there’s no escaping the reign of princesses over their generation – especially Disney Princesses. Frozen’s Anna and Elsa have only strengthened the power that the princess industrial complex wields over their developing cultural lives. If you’re tired of all the trappings of princess culture cluttering up your little girl’s childhood, or just wish to expose them to alternative female led films, TV, books, and toys – here are my top five awesome alternatives to Disney Princesses to inspire and empower your little girls. The animated films of Studio Ghibli, and Hayo Miyazaki in particular, should be a part of everyone’s cinematic childhood. My Neighbour Totoro, Kiki’s Delivery Service, and Whisper of the Heart are particular favourites of ours and they boast a wonderful range of female characters, any one of whom is a great Disney Princess alternative. Scarcely a day goes by without my daughter requesting to see at least one of them. Totoro centres on the gentle adventures of two young sisters in fifties Japan and their encounters with kind hearted forest spirits; Kiki is an entrepreneurial 13-year-old witch who leaves home and earns a living by starting the small courier business of the title; Whisper of the Heart also features a teenage girl, who is an aspiring writer seeking inspiration. I have seen them all more times than I could possibly count, and I still find them moving, inspiring, and utterly delightful. There is plenty official and unofficial merchandise around. We picked up some Totoro soft toys when we passed through Japan a few years back, and bought the 3yo a much loved Kiki dress up for Christmas. For other movies, also check out Miyazaki’s pre-Studio Ghibli Nausicaä of the Valley of the Wind for a wonderful female led eco-adventure, Ponyo for younger kids, and Spirited Away and Princess Mononoke for older ones who can take more intense scenarios. But perhaps save Grave of the Fireflies for another time – it’s possibly one of the saddest films ever made. One of the few female superheroes that non-comic fans know about, Wonder Woman remains a pop cultural feminist icon and an awesome Disney Princess alternative. Conceived in the forties by American psychologist William Moulton Marston, he wanted to “create a feminine character with all the strength of Superman plus all the allure of a good and beautiful woman”. Hmm. Anyway, Wonder Woman is a warrior, and – yes – a PRINCESS, but she refuses to let being a princess define her, and it’s something she successfully rebelled against in her very first appearance. The character’s continued fame goes back to the fondly remembered seventies TV show starring Lynda Carter. The show tied into the popular feminism of the decade, typified by the likes of Gloria Steinham – who had previously launched Ms. Magazine in 1972, with none other than Wonder Woman on the cover. ‘Retro’ Wonder Woman imagery continues to adorn all manner of merchandise today, and this iconic cartoon look is as visually appealing as any Disney Princess. There is a LOT of merchandise out there if you hunt for it, but be warned – it’s far easier to get hold of a Wonder Woman t-shirt for a woman than a little girl. In addition to Wonder Woman, also be on the lookout for Batgirl and Supergirl gear. DC licensees are much better than Marvel in creating merchandise with their female heroes. It’s time to “Woman Up” Marvel. While Frank L. Baum’s original book has been eclipsed by the colourful 1939 movie, both feature the engaging Dorothy Gale and her adventures in Oz with her three male sidekicks. While the film is wonderful, Dorothy is certainly more proactive and determined in the book, for instance not relying on her male friends to rescue her from the Wicked Witch but rescuing them instead. However she is an appealing character in both, with an iconic eye catching look that makes a nice change from glittery pastel dresses – and because the book has been out of copyright for a long time there are lots of affordable merchandise out there, ranging from dress up outfits to apps. Perhaps start with one of the books adapted for first readers, or of course there’s the wonderful film – the technicolour reveal of merry old land of Oz still remains one of the great moments of Hollywood magic, that will leave your little one on awe. Set on the fictional Isle of Struay, off the west coast of Scotland, this series of books (and now a TV series) feature the independently minded little girl Katie Morag. Wonderfully written and beautifully illustrated by Mairi Hedderwick, the stories see our young red-headed hero in her trademark white jumper, green tartan skirt, and wellies, on her everyday adventures involving her family and fellow islanders. 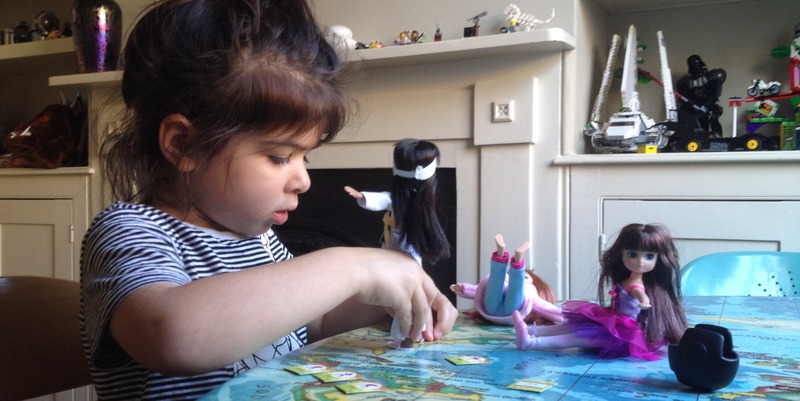 The spirited Katie is a great role model for little girls – our 3yo daughter has been inspired by this Scottish girl to be more independent herself. The books offer lots of other great female role models too, from her mother who runs the Post Office while also breastfeeding her new baby, to ‘Grannie Island’, Katie’s no-nonsense dungaree wearing, tractor driving grandmother. I really enjoy both reading these to my daughter and watching the TV show with her. What do you think about this list of alternatives to Disney Princesses? What about the princesses themselves? Are they harmful or harmless? I’d love to read about any additions you have to this (short!) list, or why you think Disney Princesses are fine. Please comment below, join the conversation on the Facebook page, or on Twitter @manvspink. Do We Need to Stop Talking About Working Mothers? Whenever there’s coverage of mothers in the workplace, it’s never long before the topic of how they cope with the competing needs of their children and their job comes up. What’s wrong with this? It’s a narrative that’s only ever applied to working mothers, and rarely – if ever – working fathers. I am not denying Ms. Willott’s very real struggle between being a parent and an MP (and Deputy Chief Whip), but yet again, the search for this ‘balance’ was presented as an issue only for the working mother. While we did see the involvement of her partner, where was the male MP also struggling in the same way, having family dinners in his parliament office, dropping off his children at the House of Commons nursery, or leaving his crying child with an aide so he can dash off to the house for an important vote? Maybe he doesn’t exist. Maybe society’s expectations of working mothers are different from those of working fathers. This was yet another example that feeds into the myth that when a mother is working, childcare is her responsibility. That the need for flexibility is the preserve of the working mother, not the father. That mothers struggle to maintain a work/life balance in a way that fathers don’t. This week there was a report about the rising costs of childcare in the UK, which is indeed a big problem for parents. Yet I kept reading how this was an issue for working mothers or mothers returning to the workplace, never about fathers. My wife has a full time job, and I freelance as well as being home with our daughter. In any discussions I enter into about work, the cost of childcare up at the top of the list when determining the feasibility of me taking on the job. The issues around flexible hours and an understanding that I may have to be absent when my child is sick are also important for my employer to know, because I am the primary caregiver to our daughter. I don’t understand why are we always framing any discussion about childcare, flexible working, balancing the demands of home and work, with ‘Working Mothers’. These issues are not exclusive to mothers – they are parenting issues. As a father, I find it depressing that people think dads don’t care this much about their children, that we too don’t lament the lost hours we could be spending with them when working. But as a parent of a daughter, I find the sexism of this prevailing attitude towards women in the workplace far more depressing. It’s an attitude that is especially toxic when there are employers that would prefer not hire a mother, because they think that it’ll be too much hassle. It’s an attitude that fathers rarely encounter. I am not seeking to diminish the emotional stress and logistical hassle of being a working mother. Despite not being a mother, I understand it completely. I just think we need to stop talking about working mothers, and start talking about working parents instead. These are issues that affect us all and problems for us all to deal with. What do you think about the way working mothers are perceived? Is being a working mother different than being a working father? Please get involved by commenting below, joining the conversation on the Facebook page, or on Twitter @manvspink. 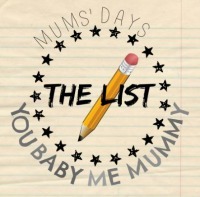 FeaturedPosted on February 20, 2015 July 22, 2015 Categories BlogTags childcare, Dads, Fathers, flexible working, Parenting, stay-at-home dad, stay-at-home dads, working mothers9 Comments on Do We Need to Stop Talking About Working Mothers? The ways in which strangers comment and connect online usually gets a bad rap. Perhaps because it’s so easy to take on another identity – or remain anonymous – in order to be vile to another person. A ‘troll’ used to be a goat eating creature that lived under a bridge in the minds of children. Sadly that monster has been usurped by an all too human counterpart. But what of the wonderful instances of selfless acts of generosity and human kindness that also occur online? Well, here’s one for you. 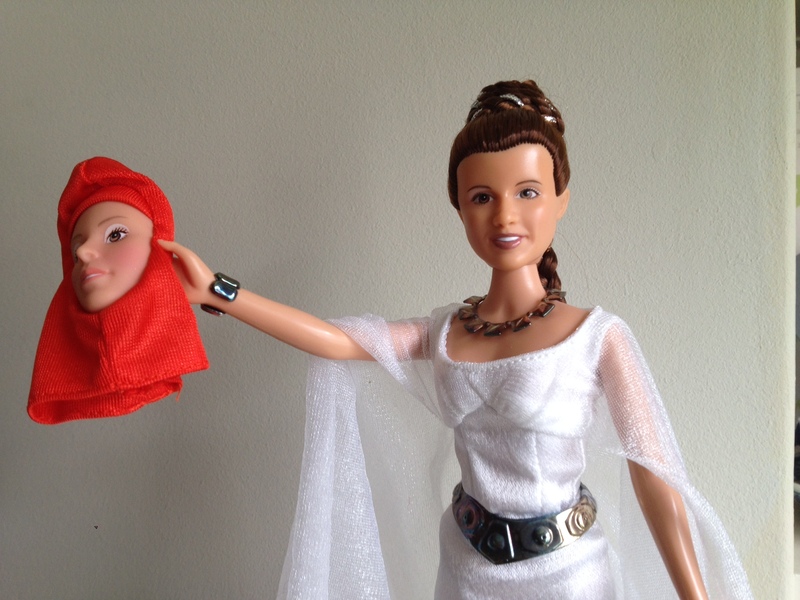 I recently blogged about the Disney Store’s lack of Princess Leia products, and their absense of interest making any. As the dad of a Star Wars loving daughter, I hoped for some meaningful response from Disney, and there was a muted assurance that they will produce Leia merchandise in the future. Emily then signed off with these delightful Princess Leia illustrations. So it was with great relish – and Emily’s permission – that my daughter and I finally liberated these toys from the packaging they had been in for the best part of the past 15 years. It would be a sight to horrify many a Star Wars collector, but delight anyone who gains any happiness from the pure joy of a child. My daugher loves these dolls. She is already swapping shoes and outfits between them. Ceremonial Leia looks pretty good wearing Padme’s large brown boots. ‘Royal Elegance Queen Amidala’s red shoes are a popular interchangeable item as well. There’s also some toddler hairstyling and tea parties happening. In 1999, the year that The Phantom Menace was out and Emily purchased all these dolls, another eagerly anticipated movie was released. Eerily, it features a young lady called Emily who parted company with her childhood playthings. In Toy Story 2 we are introduced to Jessie, a once beloved doll who has been abandoned at a roadside when her ‘Emily’ outgrew her. In reality, perfectly normal behaviour, but in the story it was a source of great sadness and emotional trauma for Jessie, who mournfully states: “You never forget kids like Emily…but they forget you.” Well, this real life Emily didn’t forget about her toys. They may not have been played with, but they were bought out of love (of Star Wars), and passed on for the same reason. According to Buzz Lightyear “(a toy’s) life’s only worth living if you’re being loved by a kid”. Well thanks to their Emily these toys will be well loved by our kid. They are out of their boxes and never going back in! The Emilys of the real world should be celebrated. She reached out to a father and daughter she has never met, with whom she had only had the briefest of online interaction with, and made the great effort to not just simply give us these toys she purchased, but to ship them across the world to us at her expense. This giveaway closes at midnight on November 15 2015. Open to UK entrants only.